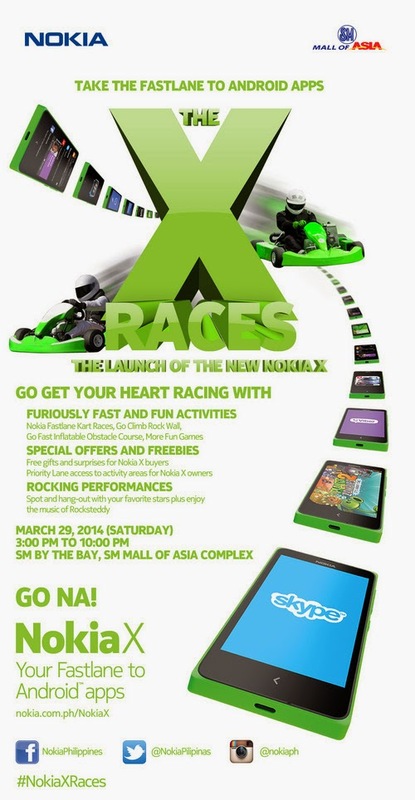 Nokia X Races Event at SM Mall of Asia on March 29 : You're Invited! TP Friends, Nokia X invites all of you to experience a fun event called Nokia X Races filled with cool activities such as Go Karting, wall climbing, obstacle courses, and other exciting things, including a chance to win cool prizes, surprise appearances by their favourite stars, and a rock concert by Rocksteddy! It is time to Xcelerate your smartphone experience and take it to the eXtreme level with Nokia X! See how the best of Nokia design, Microsoft services, and Android apps come together via this eXhilarating and eXtra special event for the general public. Join “Nokia X Races” on March 29, 2014 (that's already tomorrow, Saturday) at the SM By the Bay (back of SM Mall of Asia) from 3:00 PM to 10:00 PM, to eXperience life in the Fastlane with the new Nokia X. Enjoy the eXtremely enjoyable activities with some of your favorite celebrities; have eXcellent fun at the Go Kart, Rock Wall, Inflatable Obstacle Course areas, food kiosks, and the eXperiential Nokia X booths where you can get the best deals when you purchase Nokia X, or a chance to win cool prizes; and finally, cap your day with an eXciting rock concert featuring Rocksteddy plus other celebrity guests. Of course, for the geeky ones, you can also play with Nokia X smartphones that are on display and give them a test run. As I've explained on TechPinas, Nokia X is the first ever Android-based handset of the Finnish Giant. It is equipped with a 4-inch WVGA IPS display, 1 GHz Dual Core Qualcomm Snapdragon SoC, handles intuitive Fastlane multitasking with 512 MB of RAM, and has 4GB of internal storage expandable via microSD card slot supporting up to 32 GB. Users will also get a 3 MegaPixel fixed focus camera and a 1,500 mAh battery pack delivering 13.3 Hours of Talk Time or up to 28.5 Days of Standby Time. GO Na! to Nokia X Races and feel the Fastlane to Android apps only with Nokia X - now available in stores for only Php 5,990. See you there, TP Friends!